The earliest ancestors of vertebrates appeared in oceans over some 550 million years ago. Later, the Devonian Period (417 to 359 million years ago)—dubbed the Age of Fishes—saw the remarkable evolution of fish, which are now more diverse than any other vertebrates. Of the 52,000 vertebrate species, 32,000 are fish, which may be simply and collectively characterized as gill-bearing vertebrates that lack limbs with digits. Agnathans, which appeared during the Cambrian Explosion around 530 million years ago, were the first fish. Jawless with plated armored heads, their round mouthparts were used for sucking or filter-feeding; lampreys and hagfish are their only surviving descendants. The development of jaws, seen in the present-day cartilaginous fish and bony fish, permitted them to ingest a wider range of foods and become active hunters. The cartilaginous fish (Chondrichthyes) lack true bone but have instead rather light, flexible skeletons of cartilage, which make fish like rays, sharks, and skates very agile predators. There are 19,000 species of true bony fish (Osteichthyes), which are as disparate as eels, horse fish, trout, and tuna. Most species have a swim bladder, which is a gas-filled bag that enables fish to effortlessly maintain their buoyancy at a desired depth. Sharks and rays lack swim bladders and, since they are heavier than water (as are all fish), they will sink. They may choose to rest on the sea floor or remain in constant motion, which involves a large expenditure of energy. Water contains a fraction of the oxygen found in air. Multiple pairs of gills, through which water continuously passes, are highly efficient at extracting oxygen and removing carbon dioxide, the end-product of metabolism. There are two major groups of bony fish: the far more common ray-finned fish, which are named for the bony rays that support their fins, and the lobe-finned fish, such as coelacanth, the “living fossil,” which have rod-shaped bones surrounded by muscles in their pectoral and pelvic fins. These lobed fins evolved into the limbs and feet of tetrapods, four-legged land animals, which include humans. SEE ALSO: Devonian Period (c. 417 Million BCE), Amphibians (c. 360 Million BCE), Paleontology (1796), Coelacanth: “The Living Fossil” (1938). The most primitive fish, such as this sea lamprey, were jawless and used their round mouths to filter-feed. 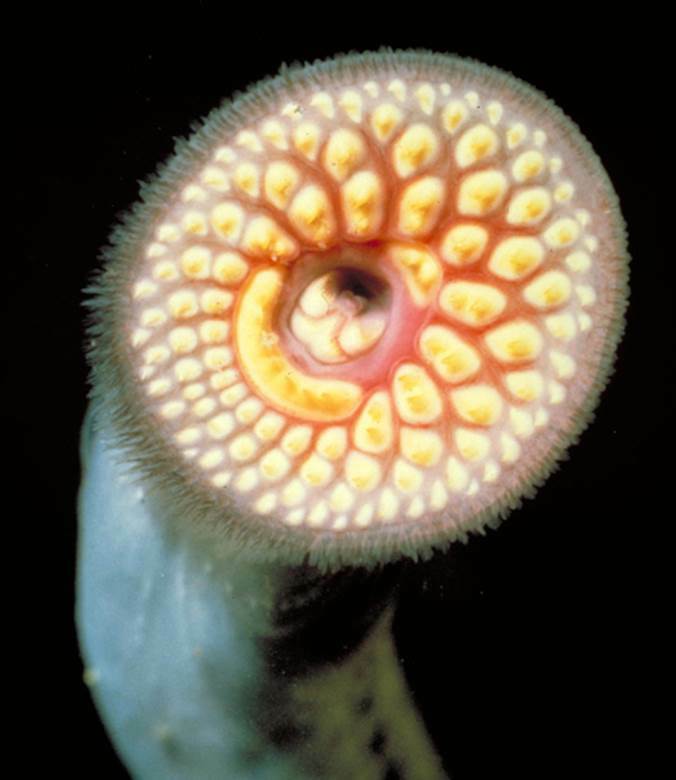 Lampreys are considered an invasive species in the North American Great Lakes, being fortunate to have no natural enemies there and feeding on such commercially valuable fish as lake trout.